Doncaster Sheffield Airport (IATA: DSA, ICAO: EGCN), formerly named Robin Hood Airport Doncaster Sheffield, is an international airport located at the former RAF Finningley station, in the Metropolitan Borough of Doncaster within South Yorkshire, England. 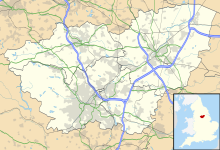 The airport lies 3 miles (5 kilometres) southeast of Doncaster Town Centre and 19 mi (31 km) east of Sheffield. Handling 1.22 million passengers in 2018, the airport is the smaller of Yorkshire's two large commercial airports, the other being Leeds Bradford Airport. The airport opened to passengers in 2005. It was initially operated by Peel Airports, a division of The Peel Group, who at the time also owned and managed Liverpool John Lennon Airport and City Airport Manchester, and had a 75% stake in Durham Tees Valley Airport. Doncaster Sheffield Airport has a CAA Public Use Aerodrome Licence (Number P876) that allows flights for the public transport of passengers or for flying instruction. The airport owes its origins to military aviation, having been founded as Finningley Airfield in 1915. During the First World War, it was used as a base by the Royal Flying Corps as they intercepted German Zeppelins targeting the industrial cities of the North. In the Second World War the airfield was used primarily for training purposes, serving as a finishing school for new crews of the larger aircraft in Bomber Command; only a few combat missions took off from Finningley. The Cold War saw the airfield's importance rise when it was used for nuclear-armed Vulcan bombers. Training once again became the priority in the 1970s and 1980s before the airport was decommissioned in 1995. Following the ending of scheduled services from Sheffield City Airport, the former RAF Finningley was reopened as Robin Hood Airport Doncaster Sheffield (DSA) in April 2005, after low-cost flights and rising passenger demand made a new commercial airport feasible. The name of the airport was controversial with 11,000 people signing a petition to oppose it. The airport's first commercial flight flew to Palma de Mallorca in Majorca, departing at 0915 on 28 April 2005. The airport was projected to serve at least a million passengers during 2006. The actual figure for its first year was 899,000, making the airport the 23rd largest in the UK. By August 2007 the new airport had handled 2.28 million passengers. Long haul flights to North America began in summer 2007, with Flyglobespan operating to Hamilton, Ontario (for Toronto), and Thomsonfly to Orlando, Cancún and Puerto Plata. All these routes have since been discontinued. In 2007, over one million passengers used the airport, however, this had decreased to around 700,000 by 2012, before increasing again to 1.255 million in 2016. In December 2009, EasyJet announced that from April 2010 it would operate flights from Doncaster to Amsterdam, Barcelona, Faro, Palma de Mallorca and Prague. These flights were expected to carry 300,000 passengers in the first year of operation. However, EasyJet withdrew all flights from the airport with effect from 4 January 2011. By 2010 the Peel Group was attempting to secure outside investment for Peel Airports. In June 2010 it was announced that Vantage Airport Group (formerly Vancouver Airport Services) had agreed to buy a 65% stake in Peel Airports, with Peel Group retaining the remaining 35%. However, following a significant decline in passenger numbers, Peel Airports sold Durham Tees Valley Airport back to Peel Group in February 2012. In the second half of 2012, monthly passenger numbers at Robin Hood fell significantly and in December 2012 it was announced that Robin Hood would also be sold back to Peel Group. As a result, by January 2013 only Liverpool John Lennon Airport was still owned by Peel Airports, with Vantage Airport Group owning 65% of this company. At Durham Tees Valley Airport and Robin Hood Airport, Vantage's involvement had ended. Robin Hood Airport was once again wholly owned by the Peel Group, while at Durham Tees Valley Airport, Peel were majority shareholders, with local councils retaining a minority stake. In 2014, Peel took back full ownership of Liverpool John Lennon, bringing all of Peel's airports back into group ownership, with Liverpool retaining its own management structure separate to Doncaster and Durham. In September 2016, the airport signed a deal with Sheffield United Football Club. This resulted in Doncaster Sheffield Airport being the club's official air travel provider. To promote the partnership, a large advertisement has been displayed across one of the stands at Bramall Lane Stadium. As a method of increasing passenger numbers at the airport, the football club has also been giving away free flights to their fans. Since the new airport link road (Great Yorkshire Way) opened, which connects Parrots Corner to the M18's Junction 3, Sheffield is only 30 minutes away by road which supports the partnership between the airport and the football club further. In December 2016, the airport received an entirely new corporate design including a change of name from Robin Hood Airport Doncaster Sheffield to Doncaster Sheffield Airport, with the Robin Hood title being downgraded to a lesser used graphic appendix. In September 2017, the airport entered a sponsorship deal with Sheffield Arena giving it the new name of Fly DSA Arena. The airport has a single runway designated 02/20, with a length of 2,895 by 60 m (9,498 by 197 ft), making it longer and wider than those at many other airports in Northern England. This stems from the airport's history as a former long-range nuclear bomber base (RAF Finningley), and makes the airport suitable for wide-bodied, long-haul or cargo-carrying aircraft. The runway is long enough that the airport was designated a Space Shuttle emergency landing site. There is significant room at the airport for further passenger and cargo capacity expansion in the future. As it stands, terminal capacity is around 2.5 million passengers annually. The passenger terminal has 24 check-in desks, six departure gates and three baggage carousels. A Ramada Encore chain hotel opened on 10 November 2008, with a 102-bed capacity. It is situated less than ten minutes walk from the Terminal building. There are four on-site car parks at the airport. Short Stay, Long Stay, Premium Parking and Meet & Greet. All car parks are operated and managed by the airport and are all within walking distance of the terminal building. Work is also progressing on a new business park across from the terminal, which will link to the access road into the airport. In March 2014 the 10-hectare (25-acre) site for the park became part of Sheffield City Region Enterprise Zone. No. 3 Hangar is presently occupied by 2Excel Aviation providing Design,production and Maintenance services. Defence company BAE Systems formerly operated its Aircraft Maintenance Academy from No. 3 Hangar at the airport, before moving to Humberside Airport. Other companies that operate within the hangars include Bespoke Training Systems Limited, a Cessna Citation service center, and Anglo European Express (Doncaster) Ltd (onsite regulated agents for air freight and cargo operations). The airport is home to two flight training schools for fixed wing and one helicopter flight school. Doncaster Sheffield Flight Training, Yorkshire Aero Club and Hummingbird Helicopters which provides Introductory flying lessons and training towards the Private Pilot's Licence. In 2011, the Vulcan to the Sky Trust relocated Avro Vulcan XH558 (G-VLCN) The Spirit Of Great Britain to the airport, arriving from its former temporary winter base, RAF Lyneham, on 29 March. It was the last airworthy example of the Vulcan bomber fleet, restored to flight by the Trust in 2007. One of the reasons for the move to a commercial airport was to improve access for the public to see XH558 up close, something not possible while based at operational RAF bases. The move was deliberately not announced in advance, both to keep costs down at the not yet complete new base, and to not overshadow ongoing repatriation flights of Britain's war casualties to Lyneham from Afghanistan. The airport remained XH558's home base until its final flight, a display over the airport, on 28 October 2015. With XH558 now permanently grounded, the Trust intends to remain at Doncaster Sheffield Airport, and make the Vulcan the focus of a new educational and heritage facility, the first stage being to establish the Vulcan Aviation Academy & Heritage Centre. This will feature an academy building for 14-18 year olds, with the Vulcan housed in an adjacent heritage centre, where it will be maintained so as to be able to perform regular fast taxi runs, the frequency of which would be funding dependent. The airport is located close to the M18 motorway; a road link from Junction 3 of the M18 to Parrot's Corner (junction of the A638 and the B6463) was opened on 29 February 2016 before being extended to the airport on 15 June 2018. Part of the Finningley and Rossington Regeneration Route Scheme, the road is called the Great Yorkshire Way, and is a continuation of the A6182 from Doncaster town centre. In addition the M18 has been widened to three lanes northbound from junction 2 (for the A1(M)) to Junction 3. Also nearby are the A1(M) and the M180. Taxis are available directly outside the terminal building. These are operated by the airports official partner - Little Arrow Taxis. There are regular bus services directly linking the airport with Doncaster Frenchgate Interchange and Sheffield Interchange. The 'X6' bus service, operated by Stagecoach Yorkshire, is an express service that departs from Sheffield Interchange. The service calls at Wickersley, Bramley, Advanced Manufacturing Park , Doncaster iPort and arrives at Doncaster Sheffield Airport approximately 60 minutes later. This replaces the previous '737' express service. In addition, the airport lies alongside the Doncaster to Lincoln railway line, and plans for a station at Finningley to replace the station that closed in 1961 were granted planning permission in 2008. However, a 2012 report by Network Rail stated that more trains on the line would be required to make the station viable. There have also been plans to connect the airport to the East Coast Main Line with a dedicated rail link. On 6 January 2010, Paul Chambers, who was intending to travel from Doncaster Sheffield, posted a message to Twitter threatening to bomb the airport. He was later arrested, tried and convicted of sending a menacing message. In July 2012, the conviction was quashed on appeal. On 15 August 2014, a Links Air flight from Belfast City Airport, operated by G-GAVA, crashed on landing at the airport following a landing gear failure which caused substantial damage to the aircraft. One passenger was taken to hospital with minor injuries. The airport was closed for several hours. During its first few years of operation, the airport has featured in the media; in particular, numerous articles on its status as the UK's newest international airport have seen it become part of the debate on air tourism and environmental issues. On 24 January 2007, the airport featured in the BBC Two documentary Should I Really Give Up Flying?, with Doncaster actor Brian Blessed fronting local opinions on the issue. The airport has also been a filming location for popular television series such as ITV's Emmerdale, BBC One drama Hustle, and In the Club. The airport was a filming location for Film4 Productions film Four Lions. The airport was one of the settings for the BBC mockumentary Come Fly with Me. Matt Lucas and David Walliams spent two weeks at the airport filming. The programme aired from Christmas 2010 through January 2011. The airport (or at that time RAF Finningley) had several appearances in the 1984 BBC nuclear war docudrama Threads, where it was destroyed by a Soviet nuclear warhead. The airport has a historical connection to Nottinghamshire (as the parish of Finningley was, until 1974 and the Local Government Act 1972, administered as part of Nottinghamshire) and still resides in the boundary of the Diocese of Nottingham. Some later Robin Hood legends, and the popular 20th-century books, films and TV programmes, are set in Sherwood Forest. The Metropolitan Borough of Doncaster is closer to what is left of Sherwood Forest than the city of Nottingham is. The forests of Sherwood and Barnsdale merged in this area of Yorkshire. The name would provide an identity which would raise a lot of attention (if a little controversy) for the airport and create a marketing opportunity. Whilst the Robin Hood name remains, future marketing will focus on the 'Doncaster Sheffield' branding. ^ "Doncaster Sheffield – EGCN". Nats-uk.ead-it.com. Retrieved 24 November 2013. ^ a b c d "UK Annual Airport Statistics". CAA. 3 March 2017. Retrieved 15 March 2017. ^ a b "Background Information". Durhamteesvalleyairport.com. 10 February 2012. Archived from the original on 6 November 2013. Retrieved 24 November 2013. ^ Delve 2006, pp. 127–128. ^ delve 2006, p. 132. ^ "Airport's new name misses target". BBC News. 12 November 2004. Retrieved 24 August 2015. ^ "'Take-off at new Yorkshire Airport'". BBC News. 28 April 2005. Retrieved 24 November 2013. ^ "Major boost for airport as UK's biggest airline set to move in". Yorkshire Post. 11 December 2009. Retrieved 24 November 2013. ^ "Robin Hood Airport". Robin Hood Airport. Archived from the original on 2 December 2013. Retrieved 24 November 2013. ^ "Our Airports | Vantage". Vantageairportgroup.com. 7 April 2009. Retrieved 24 November 2013. ^ "Aviation - The Peel Group". Peel.co.uk. Archived from the original on 2 December 2013. Retrieved 24 November 2013. ^ "Doncaster Sheffield Airport (DSA) have been announced today as the Official Airport Partner of Sheffield United Football Club". Retrieved 17 January 2017. ^ Walker, Graham (20 September 2017). "VIDEO: Fly DSA Arena takes off as Doncaster Sheffield Airport gets naming rights of Sheffield Arena". The Sheffield Star. Retrieved 13 July 2018. ^ "Ramada Encore Hotel Lands At Airport Business Park". Robin Hood Airport. Archived from the original on 2 December 2013. Retrieved 24 November 2013. ^ "Car parking | Doncaster Sheffield Airport". flydsa.co.uk. Retrieved 13 May 2017. ^ "Cessna announces first UK Citation Service Centre". FLYER. 25 September 2012. Retrieved 2 January 2017. ^ "Doncaster Sheffield Flight Training". Retrieved 20 June 2016. ^ "Yorkshire Aero Club". Retrieved 4 January 2018. ^ "Flybe Timetable (BHD–DSA)". Flybe. Retrieved 30 November 2017. ^ a b c d e f g h "TUI Airways S19 short-haul routes additions as of 04JAN19". routesonline.com. ^ "TUI Airways UK S20 long-haul changes as of 12NOV18". routesonline.com. 13 November 2018. Retrieved 13 November 2018. ^ "Wizz Air expands in Timisoara". wizzair.com. 17 January 2019. ^ "Welcome Home - Vulcan XH558 returns to Doncaster". Global Aviation Resource, 5 April 2011. ^ "Final Flight report". Vulcan To The Sky. 30 October 2015. Retrieved 31 July 2016. ^ "An exciting new life for XH558". Vulcan To The Sky, 25 November 2015. ^ "EoF Question & Answers - Vulcan To The Sky". www.vulcantothesky.org. Retrieved 14 October 2015. ^ "Airport data 2018 | UK Civil Aviation Authority". Caa.co.uk. Retrieved 3 March 2019. ^ "New £56m Robin Hood Airport to M18 link road opens". BBC News. 29 February 2016. Retrieved 2 January 2017. ^ "Second phase of 'hugely significant' Great Yorkshire Way in Doncaster completed". BDaily News. BDaily News. Retrieved 18 October 2018. ^ "First Bus South Yorkshire". First South Yorkshire. ^ "New Doncaster Airport to Sheffield Interchange bus service". Flydsa.co.uk. 6 April 2019. ^ "Proposed £280 million Doncaster airport rail link could create 70,000 jobs". Doncaster Free Press. Doncaster Free Press. Retrieved 14 July 2018. ^ "Robin Hood airport remains closed". The Guardian. 16 August 2014. Retrieved 18 July 2018. ^ Ranter, Harro. "ASN Aircraft accident British Aerospace 3102 Jetstream 31 G-GAVA Doncaster/Sheffield-Robin Hood Airport (DCA)". aviation-safety.net. Retrieved 18 July 2018. ^ "Emmerdale filming takes place at Doncaster's Robin Hood Airport". Doncaster Free Press. Retrieved 18 February 2017. ^ "Four Lions (2010) : Filming Locations". IMDb.com. Retrieved 31 July 2016. ^ "Reference to Barnsdale Forest with Map also showing Merger of Forests in this area". Robinhoodyorkshire.co.uk. Retrieved 24 November 2013. ^ Haran, Brady (4 May 2004). "Evidence of Controversy caused by Airport Name and Marketing opportunity". BBC News. Retrieved 24 November 2013. Delve, Ken (2006). The Military Airfields of Britain - Northern England : Co. Durham, Cumbria, Isle of Man, Lancashire, Merseyside, Manchester, Northumberland, Tyne & Wear, Yorkshire. Marlborough: Crowood Press. ISBN 1-86126-809-2.